The German artist, 1010, has scaled down his op-art murals into undulating collages of acryilic on hand-cut paper. The gradiating color and illusion of depth lead to a quiet, graphic statement. Like 1010's work? Check out our artist, Marcelyn McNeil. 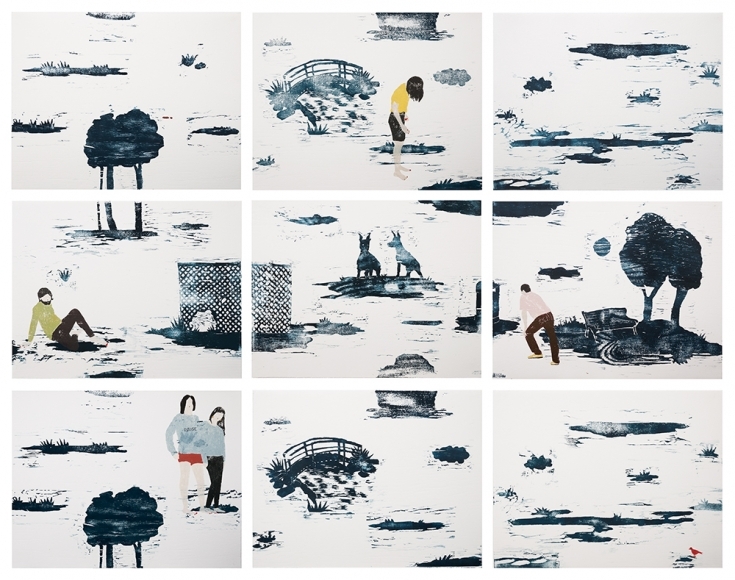 Her works on paper also experiment with the use of cut paper. Rose Black's charming monotypes seek to challenge the separation of illustration and fine art. Her bustling scenes of museums and galleries are a playful, meta study on what is considered to be exhibition-worthy. The boldy colorful works of our artist Kim Uchiyama remind us of Blake's palette, and we can see them inspiring one of the pieces hanging in Blake's museums that she hand-paints. Cybèle Young's delicate Japanese paper sculptures lend a touch of whimsy to scenes and objects from everyday life. Framed as a painting, they read as miniature theaters, as if they are a still from an animated film about our world, slightly off-kilter. 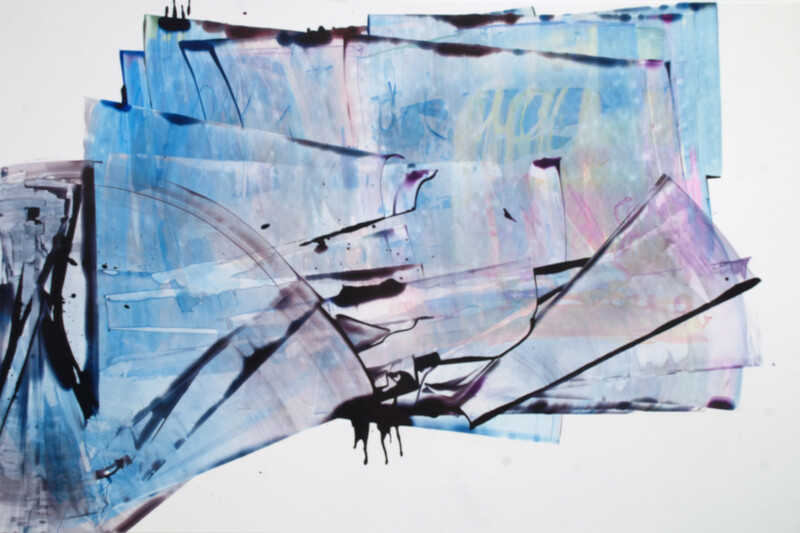 Our artist, Laura Fayer, incorporates a similar Japanese paper into her paintings. Libby Black was another artist experimenting with paper as a medium for sculpture. Her tongue-in-cheek representations of luxury goods, common household items, and commercial books are a modern, Pop take on the still life. "A Place to Hang Your Hat." Photo Courtesy of Joshua Liner Gallery. Subverted still life is also explored by our artist, Sydney Licht, who is similarly inspired by the packaging of material goods. "Wayfarers." Photo Courtesy of Owen James Gallery. Elin Rødseth's "Wayfarers" showcased a contemporary perspective on printmaking. Combining woodcuts with hand-pressed monotype additions, the suite of prints is a dreamlike scene that's in parts meloncholy, ominous, and serene. While Ky Anderson's works are paintings, not prints, many of her pieces have similar aesthetic qualities to prints.